This article documents a solution on how-to display HD video from an AHD security camera on multiple TVs / monitors. This topic was brought up because I was recently contacted by the pastor of a church who wanted to display a live video feed of the service in three different rooms of the church. In addition to being a good video solution for churches, it is applicable to many types of businesses as well. 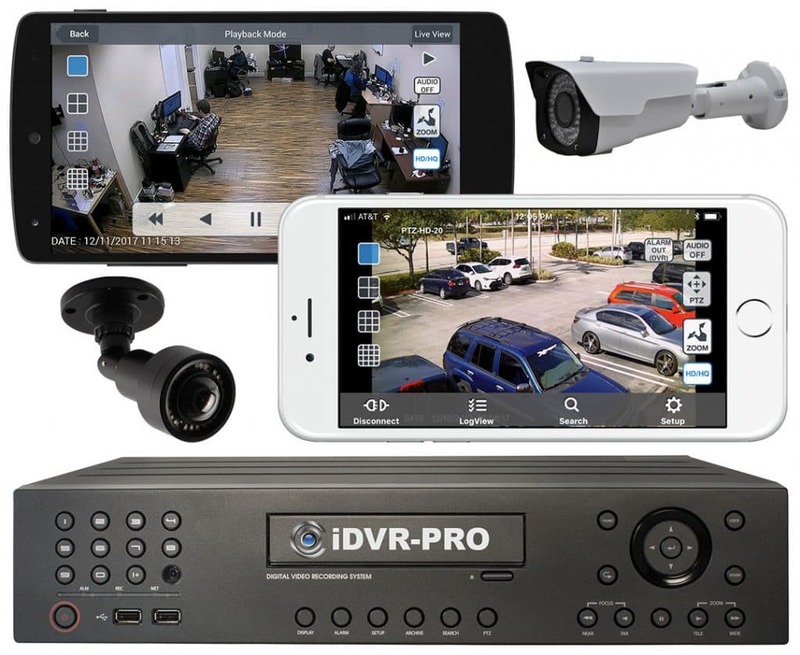 I have recommended this same solution to dance studios, hotels, department stores and many other types of businesses that want to display live video from one HD CCTV camera on multiple TVs. Please note that although I use an HD-Q7 security camera in the above diagram, any of these 1080p AHD security cameras will work. The AHD camera connects to the AHD-CV7 AHD to HDMI converter which allows you to display the camera’s 1080p video output directly on a standard HDMI TV / monitor. These pre-made RG59 patch cables are used to connect the camera to the BNC video input of the AHD-CV7. These cables already have BNC males connectors on each end which makes them a plug-n-play solution for the BNC female output of the camera and BNC female video input on the AHD video converter. In order to display the live video on more than one monitor, an HDMI to video splitter is also needed. The HDMI output of the video converter is connected to the HDMI input of the HDMI over CAT6 system. I am using a 4 port HDMI-TX4 in this example. The HDMI-TX4 not only acts as a 4 port HDMI splitter, it also lets you transmit HDMI signals over CAT6 cable to each TV. This is much more convenient than HDMI cable. You can use these pre-made CAT6 patch cables. One the TV end of each CAT6 cable run, there is an HDMI over CAT6 video receiver. These convert the video signal from CAT6 back to HDMI. The HDMI receivers do not require a power supply. Power is supplied by the transmitter over the CAT6 cable. Standard HDMI cables are used to connect each receiver to a TV. Now, each of these 4 monitors will display a live video feed from the security camera. 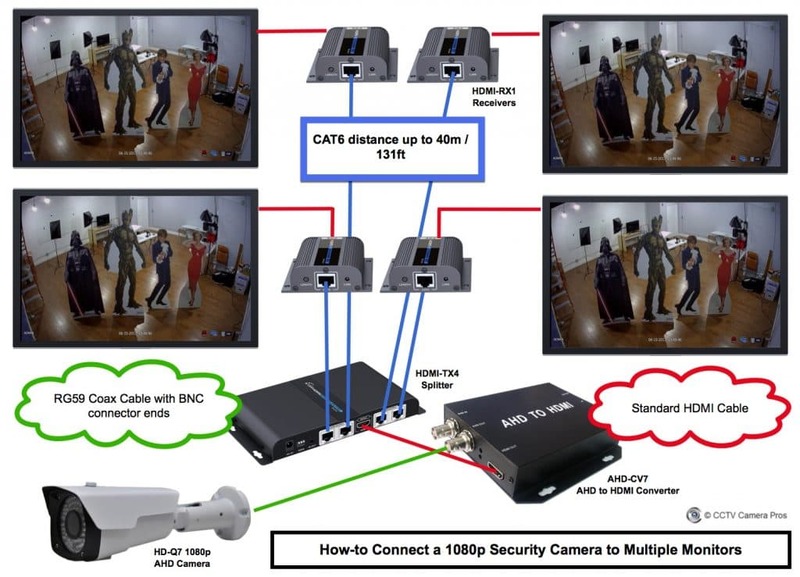 This system can be used to send HDMI video over CAT6 to up to 4 monitors. You can use just one or two monitors if that is all you need. Additional receivers and monitors can be added at any time (up to 4). 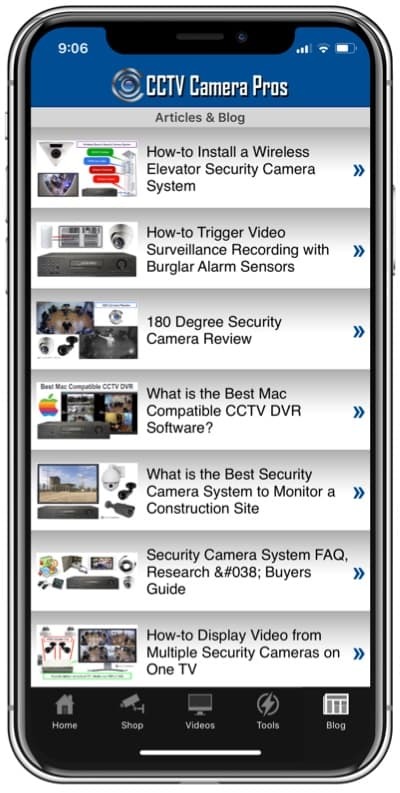 If you have any questions about this solution or anything related to security cameras and video surveillance systems, please email me or call one of our engineers at 1-561-433-8488.